Is this thing on? *tap* *tap*. Good evening friends, this is your openSUSE Board speaking. If you didn’t hear yet, Novell has agreed to be acquired by Attachmate Corporation. What does that mean for the openSUSE Project? We don’t know exactly yet because our crystal ball is currently in the shop and therefore fortune-telling is not our greatest talent ;-) However, we have other talents: we are a software developer community and we’re here to work on one of the greatest GNU/Linux distributions and other world class software distribution tools to advance Free and Open Source software together with the global FOSS community! For now, we don’t know much about Attachmate, we have had no dealings with them yet and, as Novell is a publicly traded company, all of this is as new to us as to anyone else. But the openSUSE Project has had, since its beginning, a very vibrant cooperation with Novell, especially with Novell’s SUSE business, and we are looking forward to continuing this once Novell and SUSE become part of Attachmate! Our best wishes go out to the people of our community that are employed by Novell and SUSE, may this bring nothing but good things for you and your careers. The second part of the deal relates to the intellectual property that is changing hands. Our hope is that this does not add to the minefield that software patents are today for Free and Open Source software developers. The openSUSE Board generally believes, like the rest of the global FOSS community, that software patents impede innovation and are inconsistent with Open Source and Free Software. What makes us proud is that Attachmate wants to further and strengthen the SUSE brand, which is based also on products and technology built by the openSUSE Project. Furthermore we are more than willing and looking forward to teaching another corporation about the principles, values and strengths of the Free and Open Source software development model. If you are reading this as an Attachmate employee, we would like to encourage you to just swing by and talk to us about the opportunites we can offer you to participate in this project! And apart from all that it’s business as usual and we are continuing to work on, rather than predicting, the future of this project and have a lot of fun! By the way if you wonder what that means practically, the next step into the future of this project is described in the post below: Our great bug squashing day on Saturday. See you there! At the last openSUSE project meeting and after the discussion about zombie bugs on the opensuse-project mailing list, a small team of volunteers agreed to organize a Bug Day and being available to guide new contributors. 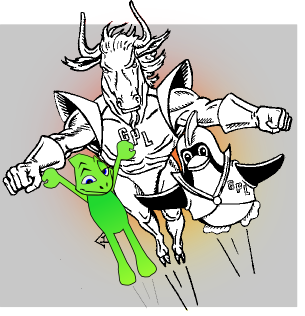 Come to the #opensuse-bug channel on the freenode network at Saturday 27.11.2010, we’ll be glad to have you join the fun!